Berean Baptist Christian Schools exist for the purpose of providing a thoroughly Christ-centered, Bible-believing educational program to prepare the student academically, physically, socially and spiritually for service to God and country. The Bible places the responsibility for educating children squarely on their parents. “Train up a child in the way he should go: and when he is old, he will not depart from it” (Proverbs 22:6). Parents are to teach God’s Word “diligently unto their children” (Deuteronomy 6:7). Christian parents must take ultimate responsibility for the success or failure of their children’s education. This is why they need to choose a truly “Christian” school. The school does not replace the parents but does assist them in training the child in God’s way. BBCS provides strong academics, a Bible-based curriculum, a Christ-centered atmosphere, and Godly teachers who are well trained and have a genuine Christian love for your child. We expect our parents to cooperate in the training of their children by providing a home environment conducive to the goals and objectives of the school. The mission of BBCS is to assist Christian parents in the training of their children to conform to the image of the Lord Jesus Christ. We cannot accomplish this mission without the full and complete support of the parents and the church, working in harmony with the school. Our ultimate goal is to create a Christ-like character in the student. We endeavor to provide a student body that comes from Christian homes in the Elementary school and students that profess Christianity in the Middle and High school. 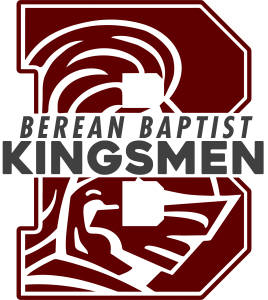 BBCS has a teaching staff that is born again Christians, degreed from Christian colleges, and supports the doctrine and philosophy of Berean Baptist Church. Our curriculum and textbooks are designed to develop Christ-like character rather than simply provide academic knowledge. Our juniors and seniors are trained to serve the Lord Jesus Christ as His will leads them. Most BBCS graduates will continue their education in Christian colleges across the country. The majority of our graduates go on to live for the Lord Jesus Christ rather than for the world. We must have parents who will assist the school by supporting the dress standards of modesty and appropriateness, by avoiding practices which cause the loss of sensitivity to the spiritual needs of the child, and by providing for the ongoing cost of education by keeping their tuition payments current. The mission of the school cannot be accomplished without the support of the Church and home.